Eating Fish on Friday? Here are two very easy fish recipes to take advantage of during Lent or anytime of the year! 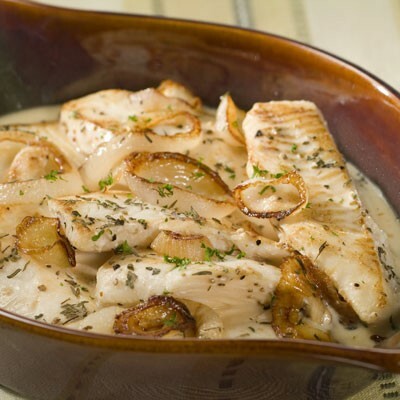 Tender fish fillets seasoned with herbs are topped with sautéed onions and baked in a light, velvety creamy milk sauce in this classic dish from Colombia’s Pacific coast. Thyme, basil and anise give the sauce excellent flavor and will be a recipe you’ll want to try again and again. PREHEAT oven to 325° F. Grease 13 x 9-inch baking dish. HEAT 1 tablespoon olive oil in large nonstick skillet over medium-high heat. Add onion; cook, stirring frequently, until tender and golden brown. Remove from skillet; set aside. SEASON fish with salt and pepper. Add remaining oil to same skillet and cook fish until browned on both sides. Remove from heat. Place fish in prepared baking dish. Sprinkle with thyme, basil and anise. Top with reserved onion rings. Combine milk and water in small glass measure; pour over fish. If desired, season with additional salt and pepper. BAKE for 20 minutes or until fish flakes easily with a fork. Convenient comfort food at its very best. This Creamy Tuna Noodle Casserole is a comforting option for any weeknight or weekend meals. MELT butter in large saucepan over medium heat. Add celery and onion; cook, stirring occasionally, for 1 to 2 minutes or until vegetables are tender. Stir in noodles, tuna, soup and evaporated milk; mix well. Pour into prepared casserole dish. Sprinkle with potato chips. BAKE for 25 to 30 minutes or until chips are golden brown.